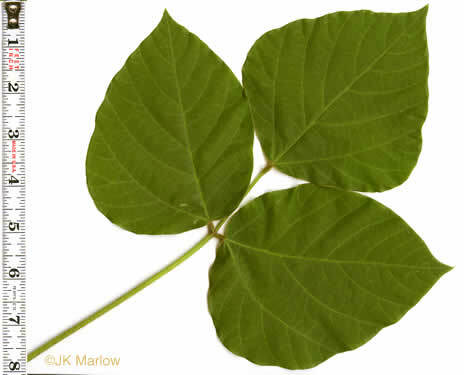 Your search found 54 image(s) of leaves that are trifoliolate and pinnately compound. 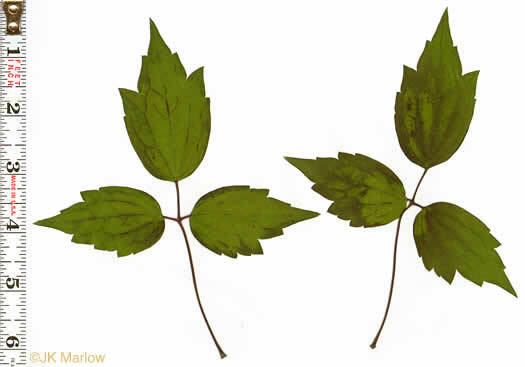 The three leaflets are coarsely toothed, per Newcomb's Wildflower Guide. 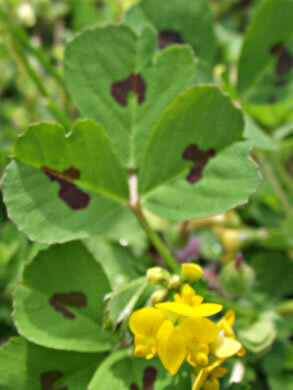 Lateral leaflets sessile or petiolules to 2mm. 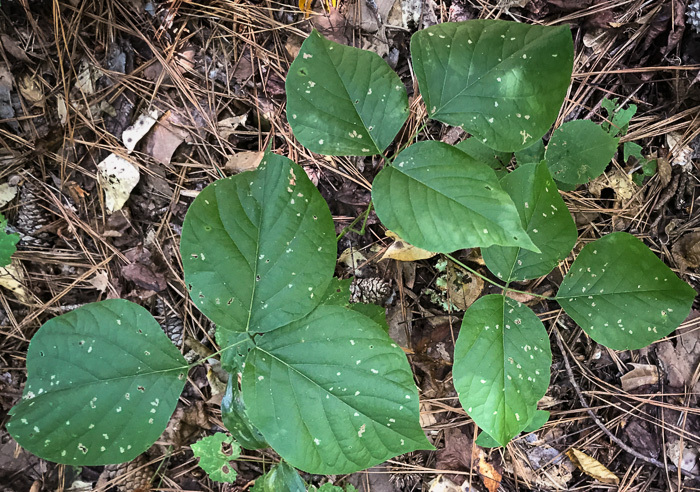 Leaves white tomentose beneath, per Vascular Flora of the Carolinas. 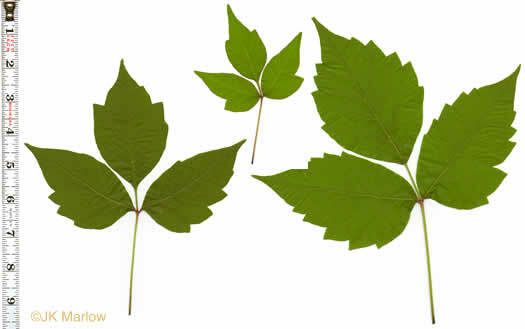 Dark green leaves divided into 3 lance-shaped leaflets with toothed margins, per Atlantic Coastal Plain Wildflowers. 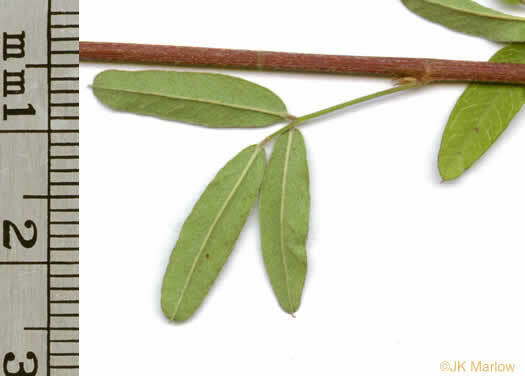 Petiolule of the terminal leaflet 1-3mm long, per Weakley's Flora. 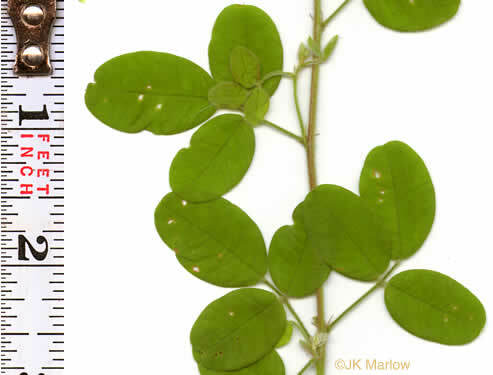 Leaves pinnately trifoliolate, terminal leaflet with a petiolule ~ 1mm long, per Weakley's Flora. 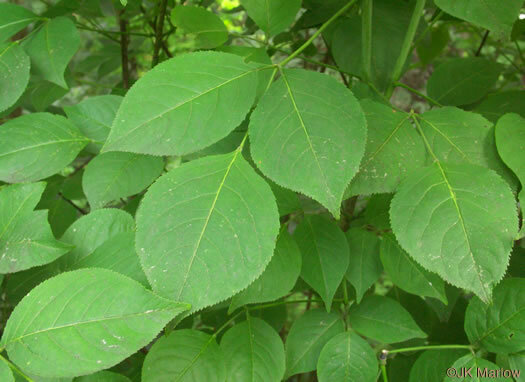 Leaflets mostly oblanceolate to obovate, margins serrulate or denticulate, per Vascular Flora of the Carolinas. 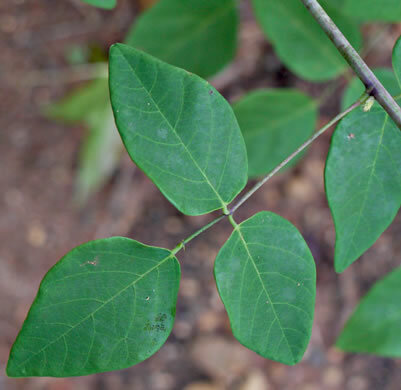 Leaflets mostly oblanceolate to obovate or somewhat elliptic, per Vascular Flora of the Carolinas. 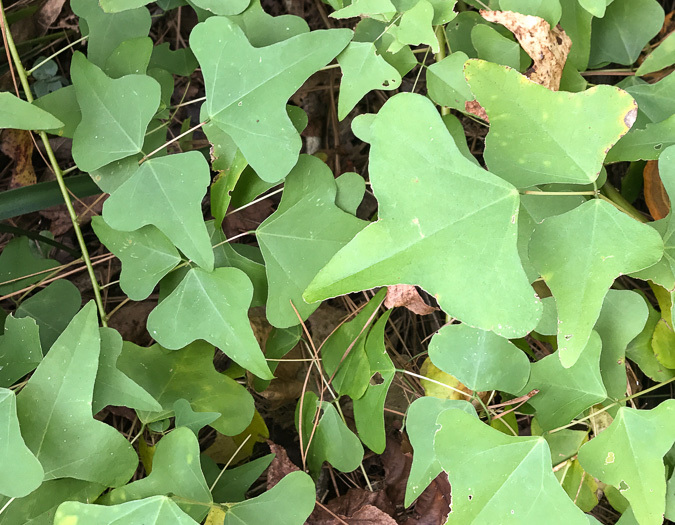 Leaves stalked and trifoliate with lance-shaped leaflets 0.4-1" long, per Wildflowers of Tennessee. 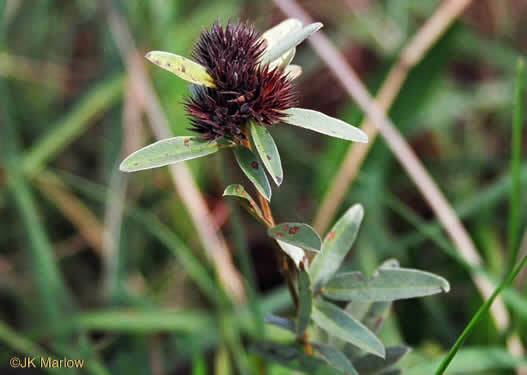 Leaflets obovate to elliptic, toothed near (& with a small spur at) the tip, per Weeds of Southern Turfgrasses. 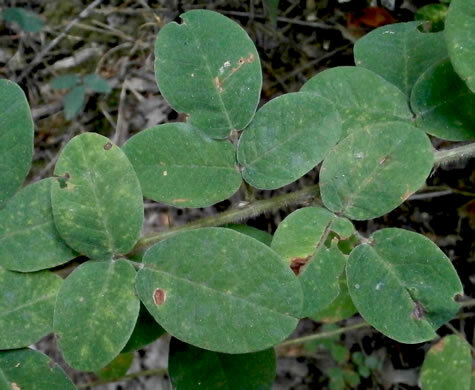 Leaflets usually with a conspicuous reddish-purple spot, per Vascular Flora of the Carolinas. 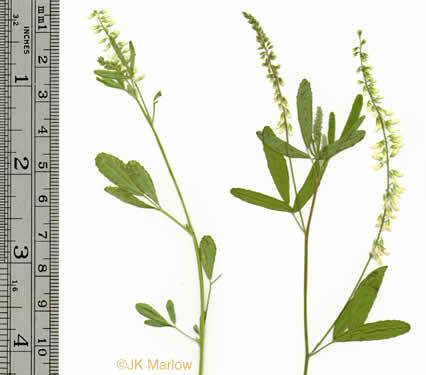 Leaflets ovate to obovate, to 4" long, crowded at top of the sterile branch, per Wildflowers of Tennessee. 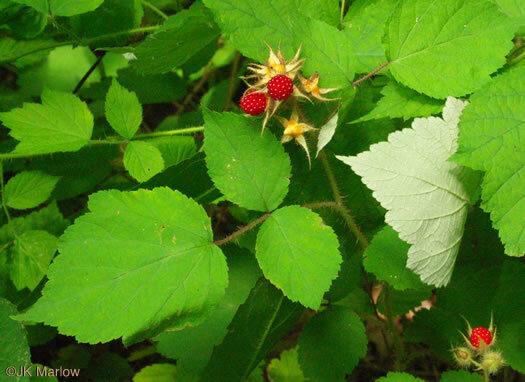 Leaves subverticillate, clustered; leaflets conspicuously & strongly acuminate, per Weakley's Flora. 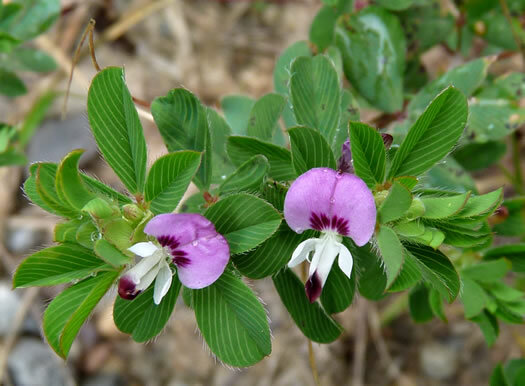 Unique in that its leaflets are nearly round, per Wildflowers of the Southern Mountains. 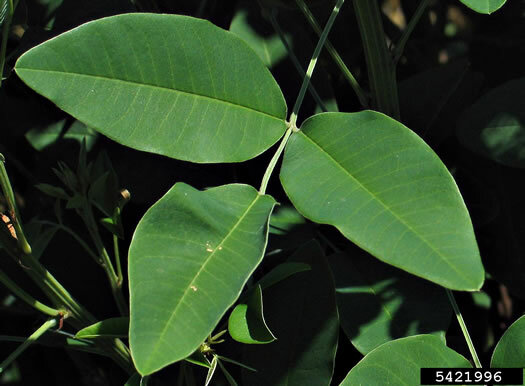 Petiole much longer than stalk of terminal leaflet, per Wildflowers of the Eastern United States. 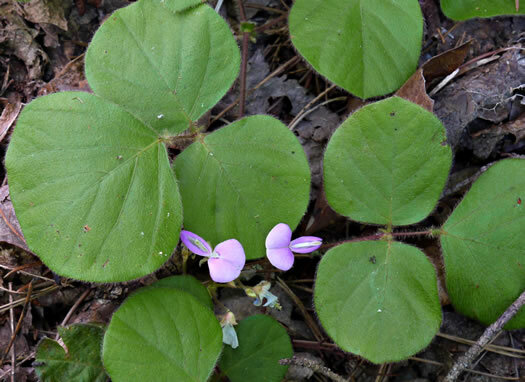 Small blunt leaflets with petioles under 3/8", more or less soft-hairy, per Wildflowers of the Southern Mountains. 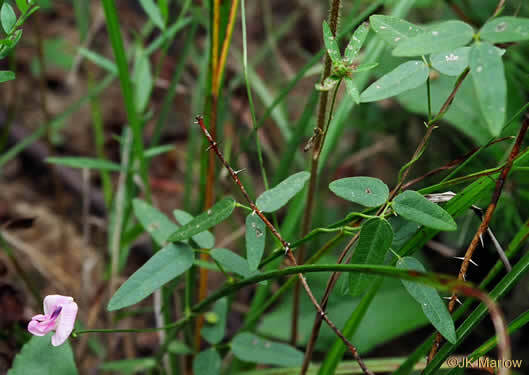 A smooth plant with long petioles, per Wildflowers of the Southern Mountains. 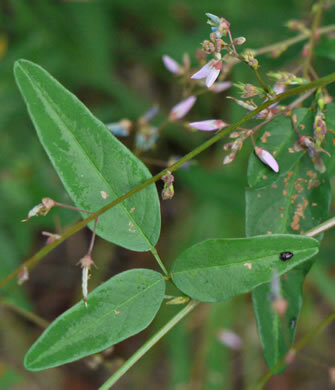 The southern mtns' only Desmodium with narrow leaflets, 1/4 wide as long, per Wildflowers of the Southern Mountains. 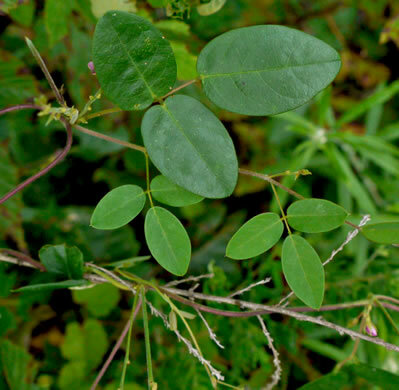 Stems and leaves glabrous, per Weakley's Flora. 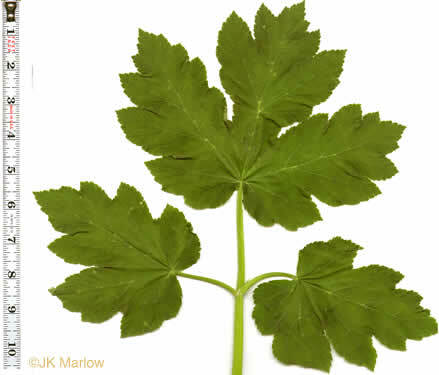 Terminal leaflet rhombic or deltoid, 3.5-11cm long; stipels persistent, per Vascular Flora of the Carolinas. 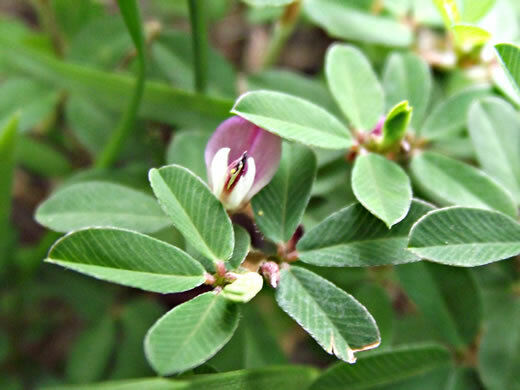 This and D. viridiflorum are the velvety-pubescent eastern species, per Native and Naturalized Leguminosae (Fabaceae) of the United States (Isely, 1998). 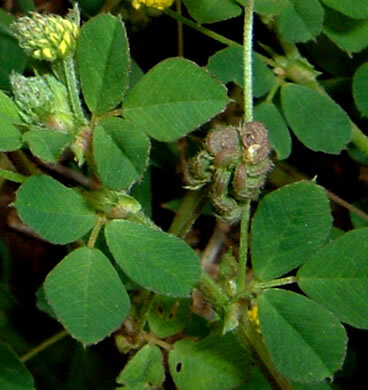 Leaflets emarginate at the apex, conspicuously spreading-ciliate, per Weakley's Flora. 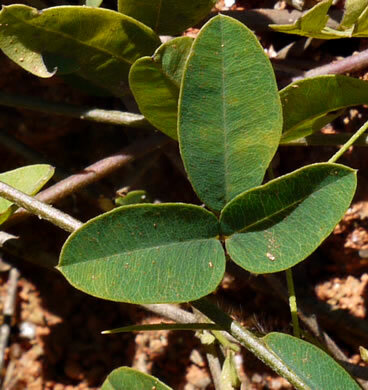 The leaflets of Kummerowia have striate, parallel lateral veins, per Weakley's Flora. 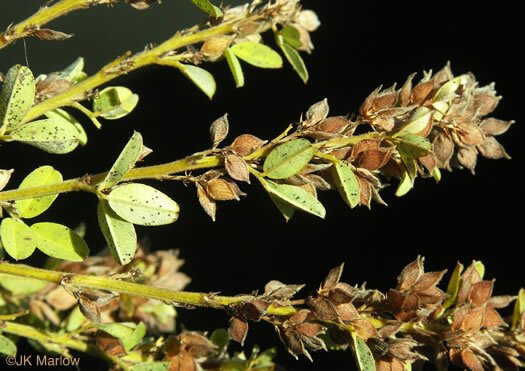 Leaflets inconspicuously appressed-ciliate, not emarginate, per Weakley's Flora. 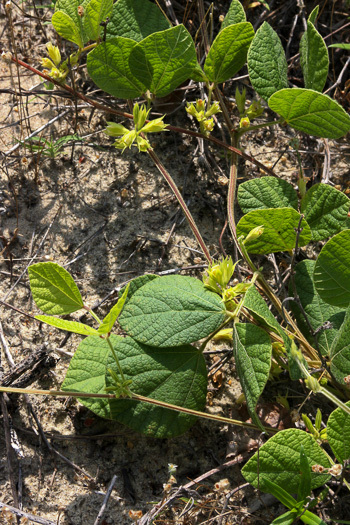 Pubescent trifoliate leaves with ovate leaflets, per Wild Flowers of NC, 1st edition. 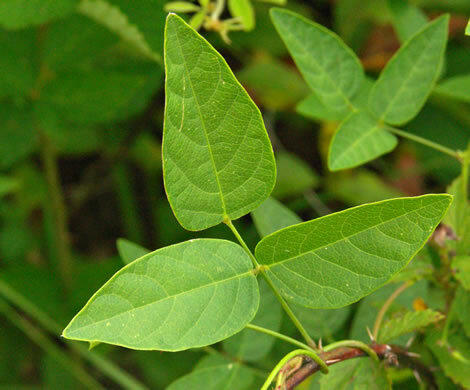 Leaflets elliptic, obovate-oblong (or ovate or oblong), ~ half as wide as long, per Vascular Flora of the Carolinas. 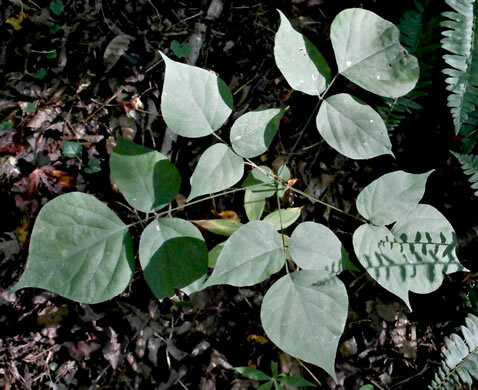 Each leaflet elliptic-ovate with a hairlike tip; underside lighter, per Nonnative Invasive Plants of Southern Forests. Leaflet base and apex both rounded. 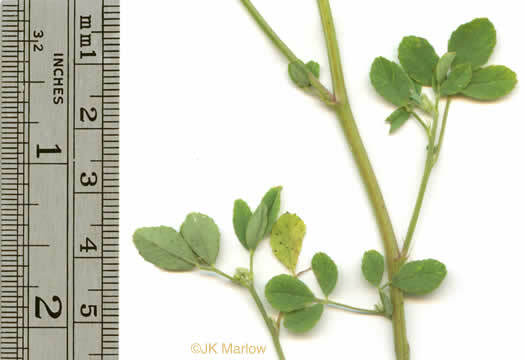 Petioles of mid-stem leaves ~ 10mm long, per Weakley's Flora. 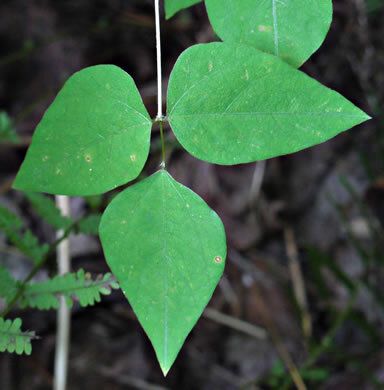 Stem and leaves densely covered with short, soft, spreading hairs, per Wildflowers of the Southern Mountains. 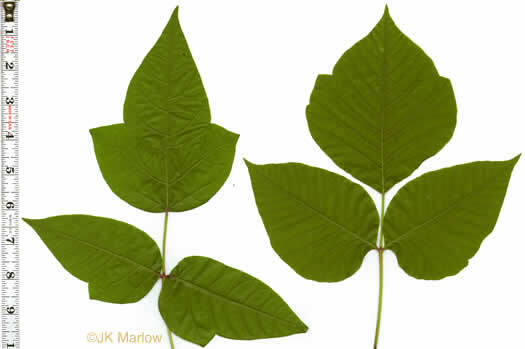 Leaflets (1.3-) 1.8-3 (-3.5)x long as wide. 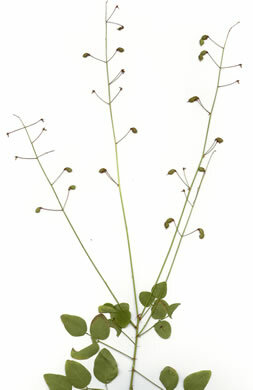 Pubescence of the stem appressed, per Weakley's Flora. 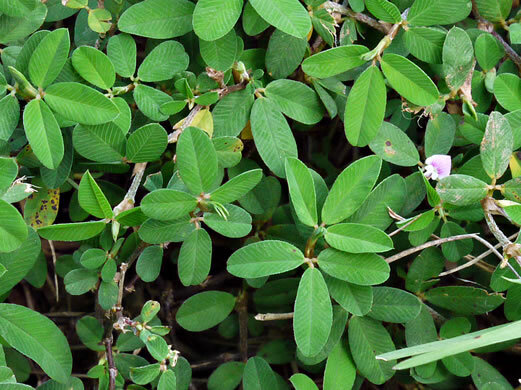 Leaflet base narrowly cuneate, the tip rounded, truncate or even retuse, per Weakley's Flora. 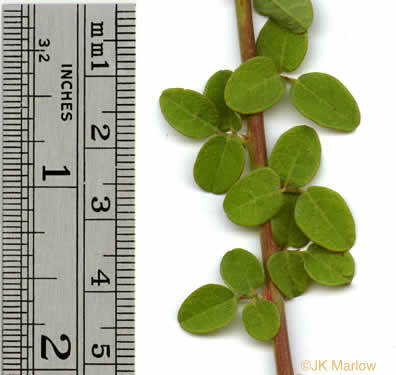 Leaflets 1.3-1.8 x long as wide, per Weakley's Flora. 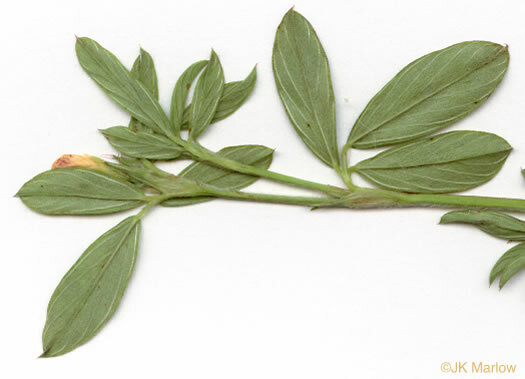 Leaflets (2)2.5-5(8) x long as wide; stem-leaf pubescence usually silvery gray, per Weakley's Flora. 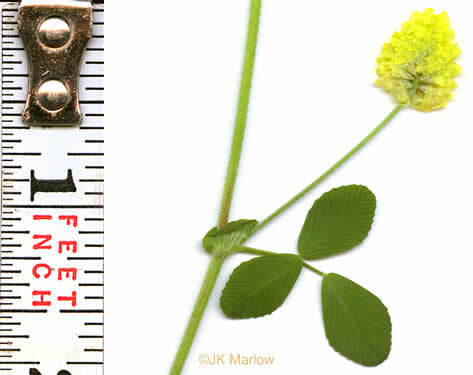 Leaflets 2-3x long as wide (vs. 1.5-2x in L. bicolor), per Weakley's Flora. 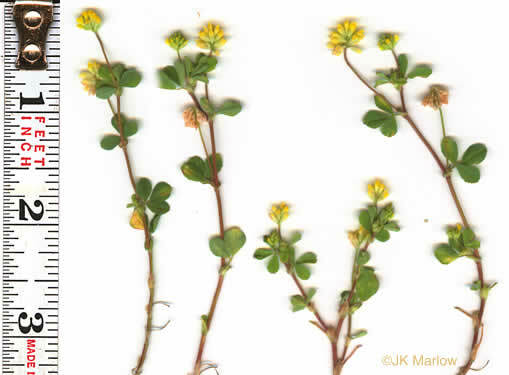 The 3 leaflets are hastate to widely deltate, occasionally prickly beneath, per Wildflowers of the Eastern United States. 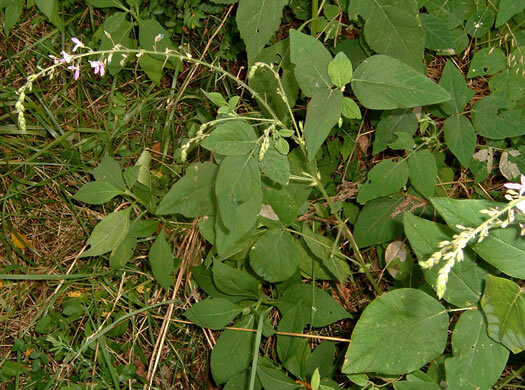 Leaflets mostly ovate or lance-shaped but sometimes linear, per Atlantic Coastal Plain Wildflowers. 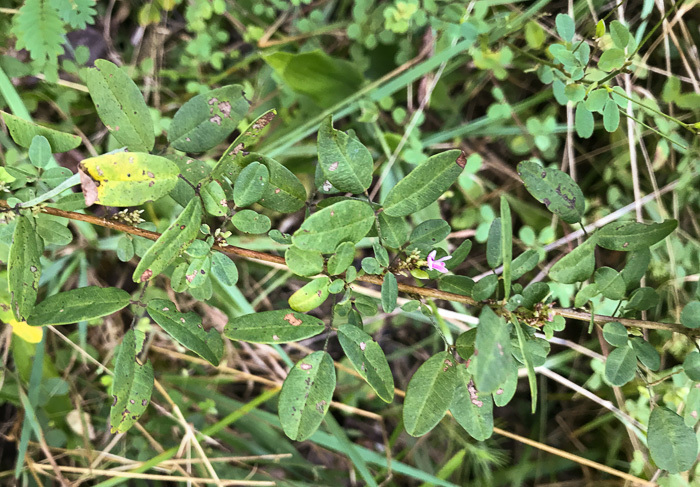 Leaflets ovate or elliptic, per Atlantic Coastal Plain Wildflowers. 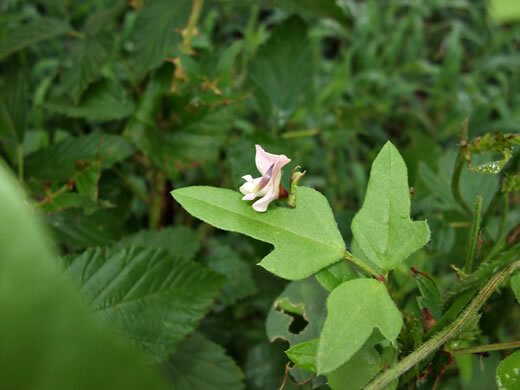 This vine's 3-foliate leaves are similar to those of the erect R. tomentosa, per Wildflowers of the Eastern United States. 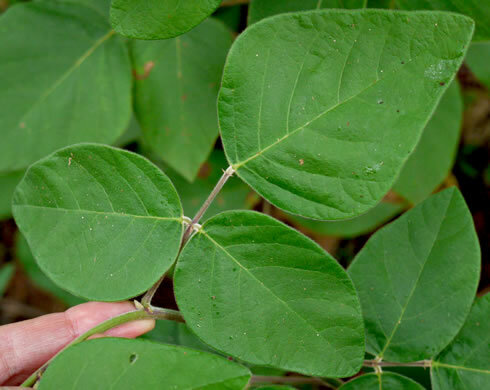 Leaves mostly 3-parted w 1-2" leaflets, tho lowermost may be unifoliolate, per Atlantic Coastal Plain Wildflowers. 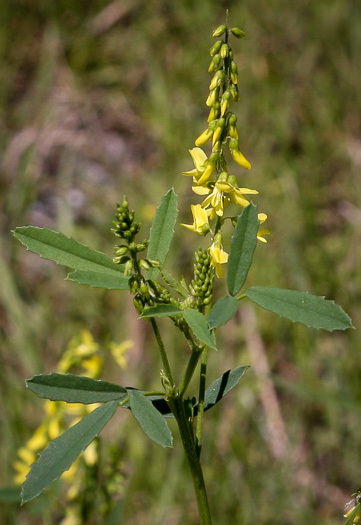 Leaflets ovate to rhombic-ovate, conspicuously reticulate; stipels linear, per Vascular Flora of the Carolinas. 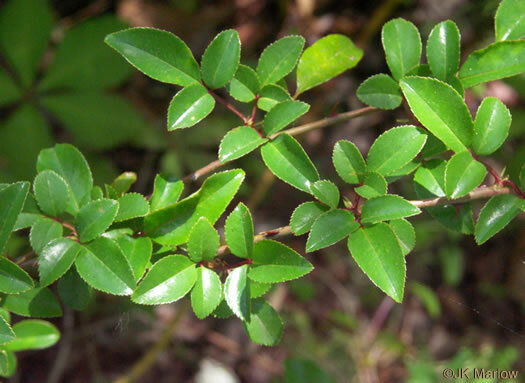 Leaflets usually prominently 3-lobed; terminal leaflet 2.5-3.5cm wide, per Weakley's Flora. 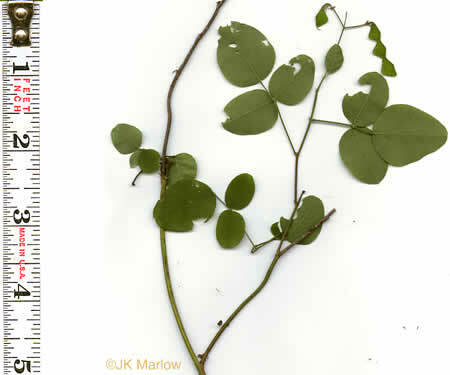 Leaflets not lobed; terminal leaflet 0.3-2.0 cm wide, per Weakley's Flora. 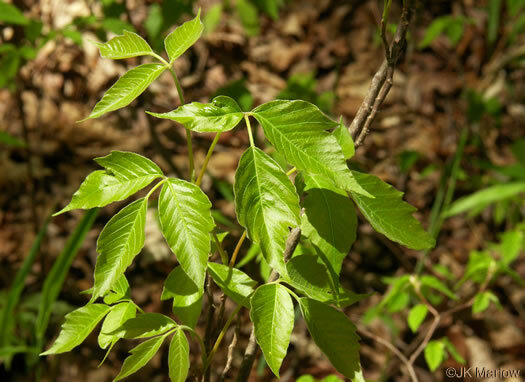 Leaves may be entire or deeply 2-3 lobed, densely pubescent beneath, per Vascular Flora of the Carolinas. 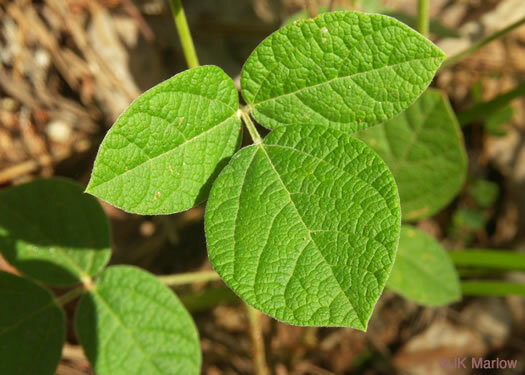 Leaflets ovate to rhombic-ovate, the lateral often assymmetrical, per Vascular Flora of the Carolinas. 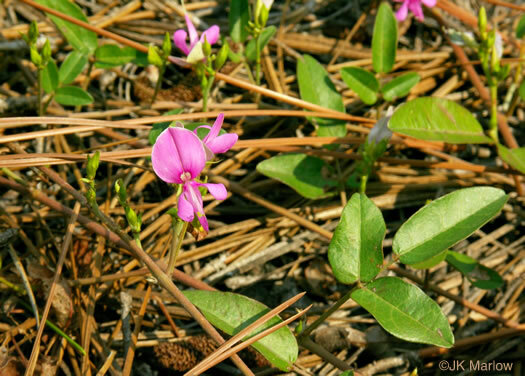 Leaflets elliptic or lance-shaped, per Wildflowers of the Sandhills Region. 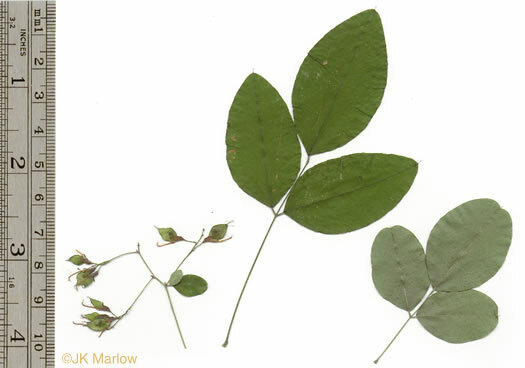 Each leaf has 3 ovate to oblong or elliptic leaflets to 2" long, per Wildflowers of Tennessee. 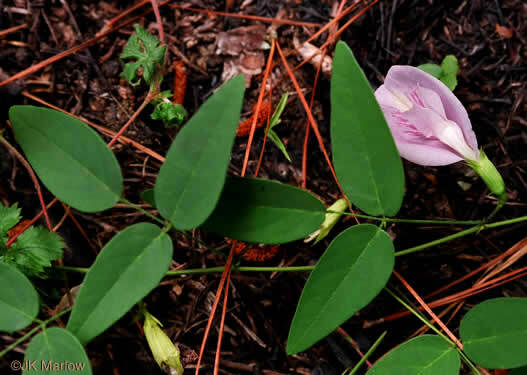 Leaflets entire to serrate to shallowly lobed; lateral leaflets sessile, per Forest Plants of the Southeast and Their Wildlife Uses. 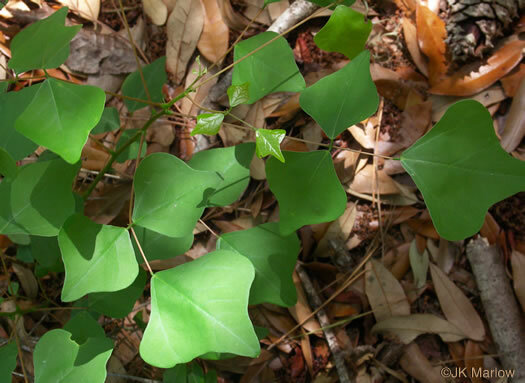 Leaves thin, softly hairy and lighter green beneath, per Forest Plants of the Southeast and Their Wildlife Uses. 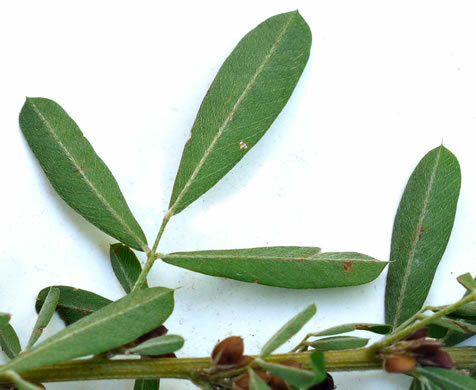 Leaf lower surface glabrous to sparsely strigose, upper surface glabrous, per Weakley's Flora. 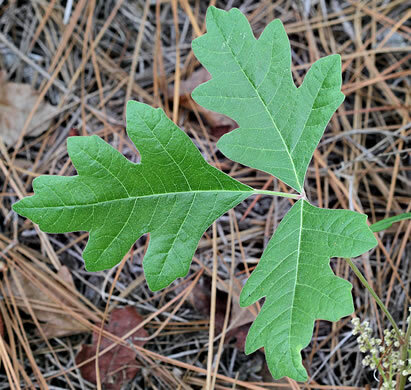 Margins with 1 to 3 undulating to incised lobes (oak-like), per Forest Plants of the Southeast and Their Wildlife Uses. 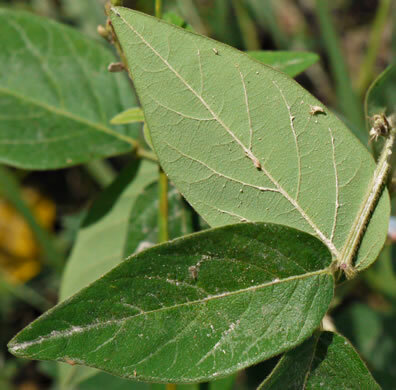 The opposite trifoliate leaves with serrulate margins are diagnostic, per Weakley's Flora. 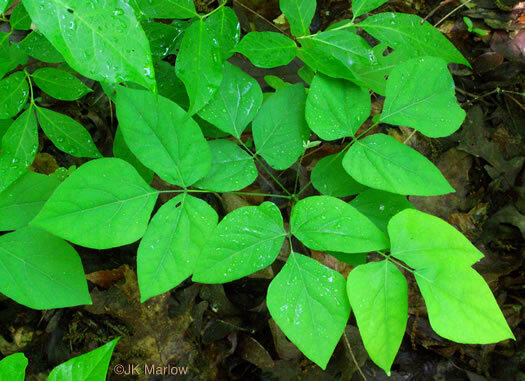 The large leaves are divided into 3 toothed, lobed, maple-like leaflets, per Wildflowers of the Blue Ridge Parkway.